Boulder is full of attractions. And not just the people. The so-called “Boulder Bubble” is an attraction, in and of itself. Maybe it’s the unexpected blend of residents: hippies, entrepreneurs, techies, students, artists, and athletes. Maybe it’s all the meditation studios or marijuana dispensaries, the unapologetically liberal politics, the university’s influence, Boulder’s rebellious history, or the thin air. It’s hard to pinpoint why Boulder is so different, but it is. Movota calls Boulder the most exciting place in Colorado. And it so is, whether you experience natural attractions like the winding Flagstaff Mountain or local businesses like the famous Celestial Seasoning tea factory. There are also popular annual events, like the Boulder Creek Festival. See more Boulder events on our calendar. This is also home to the nation’s only Buddhist-influenced university, Naropa; the largest Shambhala city center; and the largest publisher of English-language Buddhist books in the world. With deep Buddhist roots, it’s no surprise that the Dalai Lama has paid a visit to town more than once. 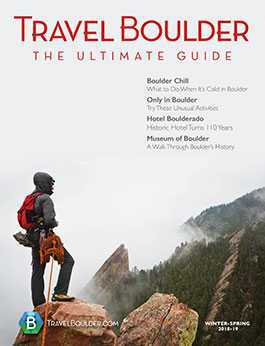 Here are some of our favorite Boulder attractions.